The evidence from observational epidemiologic studies provide some support for a harmful effect of head injuries, with risk especially elevated among those whose head injuries occur later in life or are more severe. However, few prospective studies have been conducted on head injury and AD, and they have significant methodological limitations. More importantly, the diagnosis of dementia in all prior studies has been based on clinical features rather than modern biomarker assays to identify the dementia subtype, and there have been no studies where the clinical diagnosis of AD was confirmed in pathologic studies. Thus, while head injury likely increases the risk of developing dementia, epidemiologic evidence linking head injury to AD dementia is less clear. There is much greater support for moderate to severe head injury in total dementia, and some support for mild head injury with loss of consciousness and total dementia. Of course, as there are many other harmful effects from head injury, there is ample support for current efforts to prevent head injuries. Moreover, the question of the impact of small recurrent injuries is under active investigation, and additional recommendations may emerge for youth, recreational, and professional sports and other activities in which these injuries are common. Prospective cohort studies are needed of individuals following TBI, with careful clinical evaluation and the addition of modern neuroimaging and biomarker tools and neuropathologic confirmation whenever possible. 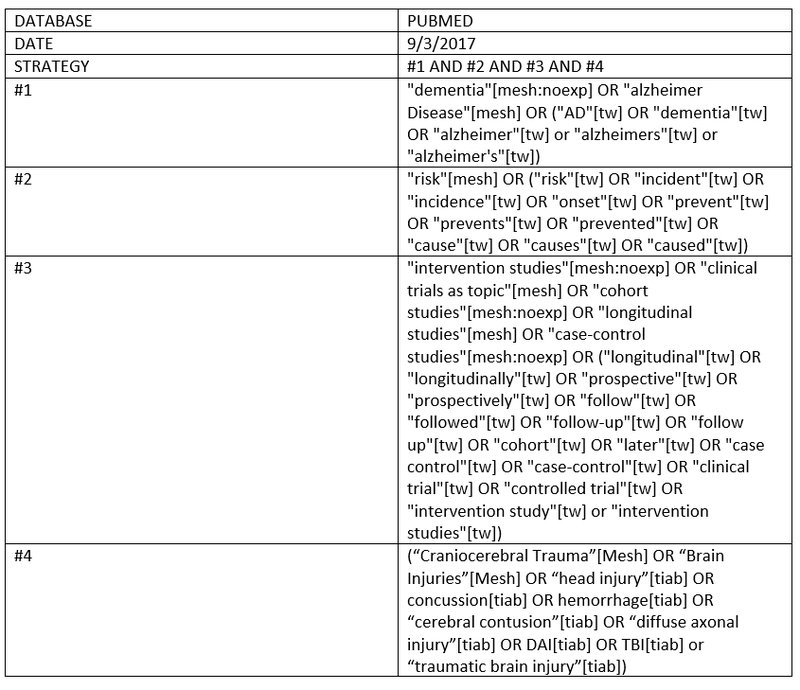 For a review of the putative mechanisms by which head injury may influence AD risk and detailed commentary on interpreting the findings below in a broader context, please view the Discussion. Last Search Completed: 03 September 2017 - Last content update released on 22 Sep 2017. We searched MEDLINE using PubMed for peer-reviewed articles reporting on the association between head injury and Alzheimer’s disease (AD) incidence in cohort or nested case-control studies. The search returned 1507 unique citations that, after title and abstract review against our inclusion criteria, were narrowed down to 20 citations for full-text review. Of these, four fully met criteria for inclusion in our summary tables. Two of these studies had study populations that overlap somewhat: one study was a pooled analysis of four European cohorts (Launer et al, 1999), one of which was the cohort used in another study (Mehta et al, 1999). Please see our methods section for more detail on our general systematic review methods. We ran an update of the search in Pubmed on June 24, 2014. The new search (which covered articles published between July 6, 2011 and June 24, 2014) returned 101 new citations. We excluded 85 citations that did not meet our inclusion criteria (e.g. topic not appropriate, review or editorial, animal studies). Fourteen studies were excluded after full text review because they did not meet inclusion criteria. One article was added to our Alzrisk tables from this updated search. We ran an additional update of a systematic search of Pubmed, for manuscripts published between June 24, 2014 and September 3, 2017. The systematic search terms used in this update, which were identical to the previous update, are provided below, minus the date limits used in each database. The search returned 158 unique citations. Three additional studies were added from relevant reviews, for a total of 161 unique citations. We excluded 156 citations that did not meet our inclusion criteria (e.g. topic not appropriate, review or editorial, animal studies). After full text review, no studies were included in the update since all studies did not meet inclusion criteria. 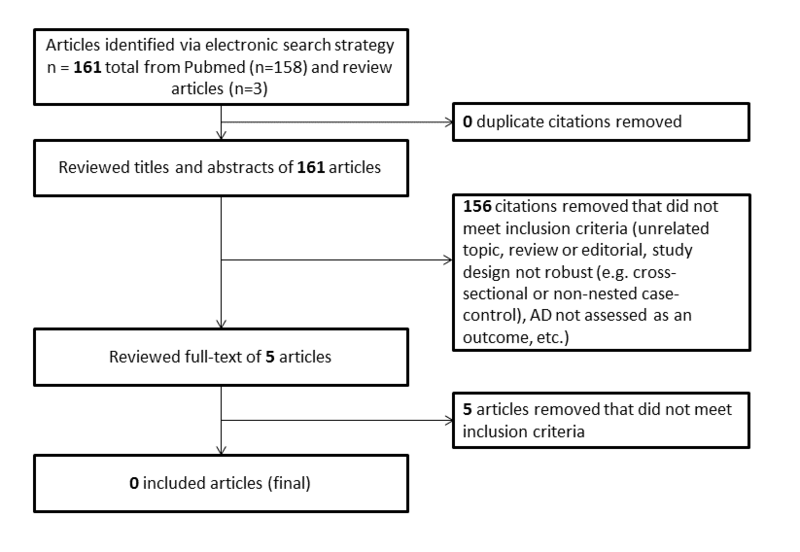 Using our systematic review methods, we developed a strategy to search MEDLINE using PubMed.